What is the Bangladesh regimen? The Bangladesh regimen is a newly developed short course 9 month regimen, for the treatment of “uncomplicated MDR TB”. “Uncomplicated MDR TB” is TB where the bacteria are only resistant to the first line drugs rifampicin and isoniazid. The standard treatment for multi drug resistant TB requires the use of “reserve” or second line TB drugs and the drugs must be taken for 24 months. The Bangladesh regimen only requires treatment for nine months. Success rates for the treatment of MDR-TB are currently very low. Two of the main reasons for this are believed to be the length of the treatment regimen, and the side effects of the second line TB drugs. The search for a shorter course of drugs started some years ago, and includes a series of studies carried out by the Damien Foundation. The series started in 1997 and consisted of six prospective observational cohort studies over a period of twelve years. The aim was to see if the two year duration of MDR-TB treatment could be shortened using novel combinations of existing drugs. The studies were carried out in Bangladesh and the first regimen was largely based on the 1996 WHO guidelines. Periodic assessment of treatment outcomes, relapses and adverse drug reactions was used to guide the introduction of changes for subsequent cohorts. The most promising results were seen with the sixth treatment regimen. A group of 206 patients treated for a total of 9 to 12 months. The duration of the intensive phase was dependent on the response at four months to smear microscopy. Overall the Damien Foundation studies treated 515 patients between 2005 and 2011. The intention was to develop an effective, safe and inexpensive treatment regimen, and the drugs to be used were chosen with extreme care. So drugs such as PAS and cycloserine, whose activity is offset by toxicity and poor tolerability, were therefore avoided. More active drugs that are also difficult to tolerate, such as prothionamide, were limited to the intensive phase. These drugs were added to a core of selected first line drugs that might be expected to work in at least some patients: ethambutol, isoniazid and pyrazinamide. High doses of certain drugs were used in an effort to maximize effectiveness. Other drugs such as high dose moxifloxacin, and a moderately high isoniazid dose were chosen to help overcome the selection of resistance. Clofazimine was chosen for its lack of known serious toxicity. An additional over riding objective was to avoid amplification of resistance and the creation of XDR-TB. XDR-TB is TB that has developed resistance to rifampicin and isoniazid as well as to at least one of the second-line anti-TB injectable drugs kanamycin, capreomycin or amikacin and also to at least one of the fluoroquinolones. High cure rates of MDR-TB were achieved only with the introduction of the fluoroquinolones. So the second line injectable drugs were not considered as core drugs, but only as powerful companion drugs protecting the fluoroquinolones. So these and other considerations led to seven drugs being used: gatifloxacin, clofazimine, ethambutol, and pyrazinamide. This was supplemented by high dose isoniazid, kanamycin and prothionamide during the first four months. Cohorts were enrolled sequentially, meaning that the various regimens were studied during different periods of time. In addition cohort sizes were not predefined. https://www.ncbi.nlm.nih.gov/pmc/articles/PMC4164715/ This review concluded that additional evidence from larger studies was needed in order to determine whether scale-up of a nine-month regimen could be recommended in less controlled conditions. In particular many people considered that there was a need for a larger multinational trial to be carried out before the Bangladesh regimen could be widely adopted. And the review also concluded that this should ideally be done in the form of a randomised control trial. It was also necessary to prove that the regimen could be equally effective when used to treat patient populations elsewhere, particularly in countries with high rates of TB drug resistance and high rates of TB-HIV co-infection. After the Bangladesh studies took place, the first multi country MDR TB trial using the nine months regimen was one taking place in nine countries. The countries were the French speaking Benin, Burkina-Faso, Burundi, Cameroon, Cote d’Ivoire, Central African Republic, Niger, Democratic Republic of Congo and Rwanda. However, it was still the case that no randomised control trial had been done. The STREAM study (Standardised Treatment Regimen of Anti-Tuberculosis Drugs for Patients with MDR TB) is an ongoing study supported by USAID. It is a multi centre international randomized control trial to evaluate shortened regimens for patients with MDR TB. STREAM was originally designed to validate a modified version of the Bangladesh regimen, by comparing it with the current WHO standard of care, under the more stringent criteria of a randomized controlled trial. The modification of the regimen was the replacement of gatifloxacin with moxifloxacin. The first trial was started in Ethiopia, South Africa, Vietnam and Mongolia and is ongoing. On 30th June 2015 the trial enrolled its 424th patient, the last patient to be recruited for phase 1 of STREAM. The STREAM study has since been expanded to test two additional shortened treatment regimens using the new TB drug bedaquiline. So the STREAM study will now consist of two stages. The first stage will evaluate the non inferiority of the Bangladesh regimen when compared to the WHO standard of care. That is, is the Bangladesh regimen at least as good or indeed better than the current WHO standard of care? The second stage will assess whether a nine month bedaquiline containing regimen is better than the Bangladesh regimen. It will also look at whether a six month bedaquiline containing regimen is at least as good as or is better than the Bangladesh regimen. The nine month regimen was to be an all oral regimen that did not require painful injections, and the six month regimen was a simplified regimen. Janssen the manufacturer of bedaquiline suggested that this second stage of STREAM would replace a separate phase 3 study of bedaquiline. It would also test whether the addition of bedaquiline could improve the Bangladesh regimen by replacing the injectable drug kanamycin. 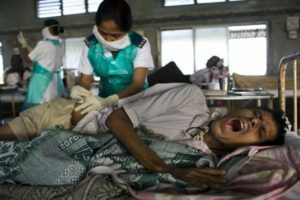 It would also establish if the duration of MDR-TB treatment could be reduced to just six months with kanamycin being given for just two months. It would also obtain important safety information about bedaquiline. However, these proposals resulted in a number of ethical and scientific concerns being raised. Following a number of discussions it was agreed in December 2014, to alter the design of STREAM stage 2. So if Stage 1 fails to show that the modified Bangladesh regimen is at least as effective as the WHO standard of care, then bedaquiline containing regimens can still be compared to the current WHO standard of care in Stage 2. In October 2017 preliminary results were reported of the first phase of the STREAM trial. It was found that the nine month regimen is very close to the effectiveness of the standard 20 month regimen recommended by WHO. Now because of the results of the STREAM study, and the the phase 3 study of delamanid, the WHO is again going to consider its recommendations for the treatment of MDR-TB which will be announced in mid 2018.